It seems like such a long time ago, although it's really only been five years, since I gathered together women of a certain age and started a bee called Mid Century Modern, where the main criterion was that you needed to be age 50+. When it was my turn to be in charge of a month, I chose a block called Winged Square (tutorial here). You can scroll through the group Flickr account to see some of the other things created during the four years that the group was active. 2018 is the year I want to complete the quilts from the years I was in that bee. "Friendship Circles" is the first one to reach the stage of completion and I absolutely love it! The quilt started with these blocks. For the longest time I couldn't figure out how I wanted to set the blocks. And then I saw this great quilt (Pink Grapefruit by Coleen Merte) in an issue of Quiltmaker magazine. These were 8" blocks and the curved parts were appliqued on. Thanks to EQ8, I was able to go to the "orange peel" block section and resize the same block to 12", print out templates and the curved sections were sewn together, not appliqued. And I just knew this setting was going to be a winner. It was beautifully quilted by Darby. I put all the signature blocks on the back, along with two additional blocks. One of the blocks had been made with Kona white rather than Kona snow and you could really see the difference. I was sorry to put it on the back because I sure love the blues and greens. I knew exactly where I wanted to have a photo shoot--at one of the local churches with a large world globe in the front, the perfect choice because of the round block setting and because some friends in the bee were from outside the United States. A good friend, Lynette Johnson, also took some beautiful photographs--the first time she had photographed quilts. I hope we do some more collaboration in the future. She took a lot of pictures and I'm including all the ones she sent me because I love each one--especially the ones where she took advantage of the setting sun. 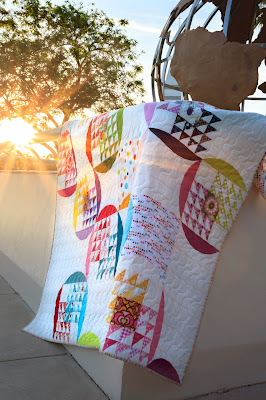 Linking up with Crazy Mom Quilts, TGIFF, and Confessions of a Fabric Addict. This is absolutely gorgeous! I love the setting with the orange peel blocks -- so creative! Wonderful pictures in a well chosen setting. You started with great blocks, but then you took them to a whole new level with your setting choice and the rounded elements. What a winner! This is beautiful! I am sorry I don't "EQ" for those orange peel shapes! Great work and design. lovely quilt, great idea to set them with that curved piecing. And great pix! Wins all around! I am loving this! Great work! It’s stunning. I’d really like to start a bee again some day. I miss that collaborative part of quilting. I just realised I've made that block! I think for a bee I was in! You've made it look so different and I adore the circles. It's absolutely stunning! Such beautiful pictures, I love the sunshine one! I can hardly believe it’s been five years since I made my block for you! I was so honoured to be asked to be part of this Bee, all the way in Australia! I love this setting! It is unique and bold, giving each block a chance to shine! And each one of the photos is beautiful! I look forward to seeing all your MCM bee quilts finished! It’s a real walk down memory lane. oh I was SO happy to see this quilt finish - for the deja vu moment and just for the wonderful way you brought our blocks together. I really love it! Stunning! The way you set those blocks was a genius idea -you've created a gorgeous quilt here. Beautiful quilt. Having it finished has to be a great feeling. This is an amazing finish. Well done! Thanks for linking up with TGIFF. I am so happy to see this quilt finish, Cindy! You did a marvelous job with the layout and solid pickle dish pieces. It's the perfect combo to make the quilt sing. Isn't it great when the right inspiration comes along? I'm smiling to see my own block among them, and on the front! :-) This is a real keepsake, and I hope you find many places to show it off.